Growing numbers of women are becoming addicted to gambling, figures from advice charity GamCare suggest. More than a quarter of gambling addicts using the charity's online message forum are now women. GamCare said women represented some 2% of clients in 2000, rising to 9% of counselling clients and 18% of helpline callers in the second half of 2005. Overall, 6,563 people used the charity for counselling in 2005, a 41.3% increase from 2004, it said. GamCare said gambling rates were rising for both men and women, and pointed to the increasing numbers of people contacting its online help forum. Between July and September last year it had more than 7,500 visits. In the three months that followed, the figure soared to 42,600, and then more than doubled to 89,400 in the early part of this year. The figures come amid an explosion in the popularity of online gambling and as 27 local councils are currently bidding for the right to build the UK's first Las Vegas-style "super casino". The Casino Advisory Panel will announce its shortlist of councils on Wednesday. In a report released to the BBC, GamCare said until recently the issue of women and gambling had not received the public attention it warranted. It also said women were still under-represented among those clients coming for addiction counselling. "Why women are not being seen in greater numbers is complex. Stigma and shame are likely to be strong factors," said GamCare. Faith Freestone, a gambling expert and therapist, is writing a report on what she describes as "the explosion" in female gambling. "The internet is making all the difference now," she told the Six O'Clock News. She said most women "wouldn't be seen dead" inside a bookmaker's but were happy to spend hours gambling online with credit cards. "Gambling has become so accessible and so de-stigmatised that, unfortunately, it can only get worse. As more people are exposed to gambling, more people will become addicted." Last month online gaming site Partygaming saw its first quarter revenues rise by 54% to $342.6m (£193.6m) following a record number of people signing up to play poker online. 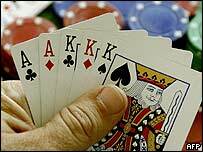 The group's poker players leapt by over 20% to 263,254, of which 39% were from outside the US. Partygaming said it could not comment on GamCare's figures on women gamblers, because such details on its customers were "commercially sensitive".